The building code now includes special requirement for generators and transfer switches supplying fire pumps. This article captures those unique requirements and translates them into associated equipment sizing implications. Where a generator set supplies power to an electric fire pump there are special sizing considerations outlined in the National Fire Protection Association (NFPA) and National Electrical Code (NEC) requirements. The generator feed to a fire pump is typically one of two circuit arrangements. One arrangement uses a transfer switch integral to a fire pump controller (not shown). The second arrangement uses a listed fire pump transfer switch separate from a fire pump controller. For fire pump service, both an automatic transfer switch and a bypass-isolation transfer switch are available. This sizing recommendation covers sizing the generator set for either arrangement and sizing the transfer switch for the second arrangement, where separate from the fire pump controller. Background: NEC 695-7 requires that voltage dip no more than 15% of rated controller voltage at the fire pump controller line terminals (includes cable drop) during normal starting of the fire pump motor. This may translate to oversizing the generator set by a factor of two or three times to provide required motor starting kVA compared to when a 30-35% starting voltage dip is permitted. Where the fire pump is the only significant load on the generator set, the starting kVA required will be much greater than the required running kVA. Since there are practical limits to the alternator capacity in a generator set, a larger genset may be required, resulting in a light load running condition for the engine (less than the recommended minimum of 30% of rated kW). To alleviate this, consider adding additional loads with low starting requirements, such as lighting, or the application of supplemental load banks, especially during normal routine system testing. All fire pump controllers, whether reduced-voltage or DOL (direct-on-line), full voltage, include an emergency manual mechanical means to start the fire pump under full voltage should the starting circuit or contactor coil malfunction. The exception to NEC 695-7 states that the 15% voltage dip limit does not apply when using manual starting emergency means. Caution: Generator suppliers recommends an analysis of generator set voltage and frequency dip performance when using the manual DOL starting. This analysis may indicate a larger generator is required to achieve desired performance during this condition. This may be desirable to get assurance that the fire pump controller does not drop out when automatic reduced voltage transition from start to run occurs prior to when the pump achieves near rated speed or when the pump cannot be accelerated during reduced voltage due to high operating head pressure. Generator sizing software allows a complete analysis of fire pump starting requirements. Using a special fire pump load icon in software for the fire pump motor, establishes a maximum allowable Peak Voltage dip of 15% while starting the fire pump load (all fire pump loads will be included in the peak load calculations) after all other loads are already running on the generator. Using computer calculations, first size the generator with the starting means desired (DOL or reduced voltage) using the fire pump load icon. If the fire pump using DOL starting, is centrifugal (most are) and is not starting into a significant head pressure, then check Low Inertia in the fire pump motor load entry form. This will reduce the starting kW requirements for the genset. The generator will be sized to achieve the maximum 15% peak voltage dip. Then, delete the fire pump load(s) from the project. You will be asked if you want to reset the maximum peak voltage dip. Change this to the same value used for the maximum allowable step voltage dip. Then replace the fire pump load(s) with a regular motor load, DOL and check the cyclic box to obtain the peak load for both motors while allowing the peak voltage dip to exceed 15% for the emergency operating condition. Use the largest generator recommendation from these two calculations. Note: It is not necessary to size the generator set for locked rotor current continuously. Size any over current device upstream of the fire pump controller on the utility line side to hold locked rotor current of the fire pump motor continuously, typically a minimum of 600% of motor FLA (Full Load Amps). Because the maximum allowable current-limiting fuse for a given size transfer switch is higher than the maximum allowable molded case circuit breaker, using current-limiting fuses in lieu of a circuit breaker may allow a smaller transfer switch to be used. Sizing the feeder conductors Size the feeder conductors at a minimum of 125% of the motor full load current or next higher ampacity. Feeder conductors run from the circuit breaker at the generator (CB2) to the fire pump controller line terminals and from the load side of CB1 to the fire pump controller line terminals. The voltage drop requirement of NEC 695-7 also applies, so if the motor is large and the run is long, the feeder conductors may require oversizing. The facility designer is responsible for cable drop calculations. Initially, size the ampere rating of the transfer switch to be equal to or next size greater than the required feeder conductors. Verify that the over current device used on the utility line side, CB1, does not exceed the maximum allowable circuit breaker or fuse size allowed for the transfer switch. If it does, increase the transfer switch rating to one that includes CB1 as an allowable pstream breaker. selectively coordinating this breaker with locked rotor protection within the fire pump controller, and d) having sufficient available fault current from the generator to clear a faulted fire pump circuit without opening other branches of the generator supplied emergency system. The circuit breaker should be a standard molded case circuit breaker; magnetic-only breakers and non-automatic molded case switches are not recommended A magnetic-only (instantaneous trip) circuit breaker is not recommended. These breakers are UL Component Recognized, but not UL Listed devices. They are only suitable for use in a UL listed assembly, and are typically included with overloads as part of a UL listed combination motor starter. They are not UL listed for feeder conductor protection. A non-automatic molded case switch with integral high instantaneous self-protection is not recommended. If the fire pump circuit is faulted, the generator may have insufficient available fault current to trip the switch. If the fire pump branch is not interrupted during a fault, an upstream device may trip, leaving other emergency branches without power. Size molded case breaker CB2 greater than 125% but less than 250% of the motor full load current. NFPA 20, 6-6.5, requires this breaker to pickup the instantaneous load. NEC 695-6 (d) prohibits overload protection, but requires short circuit protection. With a minimum rating of 125%, by exclusion, the breaker is not providing overload protection according to NEC 430-32. With a maximum rating of 250%, for the breaker, by definition, qualifies as short-circuit protection as shown in Table 430-52 of NEC. Within the range of 125% to 250%, select the smallest over current device that will allow pump motor locked rotor current to flow longer than the 20 seconds allowed by the fire pump controller integral protection. Are you subject to the RICE MACT? No? Are you sure? The term “RICE MACT” refers to the National Emission Standards for Stationary Reciprocating Internal Combustion Engines (RICE), codified at 40 CFR Part 63, Subpart ZZZZ. The RICE MACT rules apply to any piece of equipment driven by a stationary RICE located at a major source or area source of hazardous air pollutants (HAP). The rule was originally promulgated on June 15, 2004, and applied only to RICE rated at over 500 brake horsepower (bhp) that were located at major sources of HAP emissions. Since then, the RICE MACT has been revised two (2) times: Once in January 2008, and again in March 2010. With each revision, the U.S. EPA has cast their net a little bit wider, capturing more and more RICE units. Now, the RICE MACT potentially applies to any stationary reciprocating internal combustion engine, regardless of size, located at both major and area sources of HAP emissions. There are some exemptions, of course. First of all, the RICE MACT only applies to stationary RICE. Stationary RICE differ from mobile RICE because a stationary RICE is not a non-road engine as defined at 40 CFR §1063.30, and it is not used to propel a motor vehicle. Stationary RICE are used in association with generators, fire pumps, water pumps, black start motors, compressors, etc. Is your facility a major source or area source of HAP emissions? A major source is a plant site that emits or has the potential to emit any single HAP at a rate of 10 tons per year or any combination of HAP at a rate of 25 tons per year or more. An area source is any plant site that is not classified as a major source of HAP. When determining your major source status, it is important to keep in mind that major source status is determined based on your plant’s potential to emit, a term that is defined by U.S. EPA. Unless otherwise restricted by one or more federally enforceable permit conditions, you must assume that your plant operates 8,760 hr/yr at maximum capacity while processing your worst-case HAP-emitting material and/or while firing your worst-case HAP emitting fuel when determining your potential to emit. Even though your facility may actually emit very small amounts of HAP, your facility’s potential to emit HAP could be above major source thresholds. A stationary RICE with a site rating of more than 500 brake horsepower located at a major source of HAP emissions if construction or reconstruction commenced before December 19, 2002. A stationary RICE with a site rating of less than or equal to 500 brake horsepower located at a major source of HAP emissions and any stationary RICE located at an area source of HAP emissions if construction or reconstruction commenced before June 12, 2006. A stationary RICE with a site rating of more than 500 brake horsepower located at a major source of HAP emissions if construction was commenced on or after December 19, 2002. A stationary RICE with a site rating of equal to or less than 500 brake horsepower located at a major source of HAP emissions and any stationary RICE located at an area source of HAP emissions if construction commenced on or after June 12, 2006. A stationary RICE with a site rating of more than 500 brake horsepower located at a major source of HAP emissions if it meets the definition of reconstruction in §63.2 and reconstruction commenced on or after December 19, 2002. A stationary RICE with a site rating of equal to or less than 500 brake horsepower located at a major source of HAP emissions and any stationary RICE located at an area source of HAP emissions if it meets the definition of reconstruction in §63.2 and reconstruction commenced on or after June 12, 2006. The month and year in which the engine was produced in the factory is the engine’s Manufacture Date. The date that the engine was purchased and/or installed at your facility is the engine’s Construction Date. The Rated Capacity of the engine refers to its maximum brake horsepower output (bhp). Determining an engine’s rated capacity could be as simple as reading a number off of a name plate, or it could require some investigation on your part using manufacturer literature that you have onsite or obtained from the manufacturer’s website. Many times, a call to the manufacturer may yield the answers you seek. Many engines are designed to fire gasoline, diesel, propane, or natural gas. But there are other, less traditional fuels that are fired in some engines. For example, some engines are designed to fire landfill gas, or a combination of fuels such as landfill gas and natural gas. Knowing which fuel(s) your engine is capable of firing is an important clue to understanding how your engine fires its fuel. Is your engine a compression ignition (CI) or spark ignition (SI) engine? If it is an SI engine, is the engine a four (4) stroke rich burn (4SRB) engine, four (4) stroke lean burn engine (4SLB), or a two (2) stroke lean burn (2SLB) engine? Each of these terms (4SRB, 4SLB, and 2SLB) is defined in the rule. Determining whether an SI engine is 4SRB, 4SLB, or 2SLB oftentimes can be determined from manufacturer literature. However, you may end up having to contact the engine manufacturer. Once you know all there is to know about your RICE, you can finally sit down, crack open the rule, and begin to work your way through this regulation. If you determine that you do have an existing RICE that is subject to an emission limitation and/or work practice standard, your RICE’s compliance date requirement was June 17, 2007, May 3, 2013, or October 19, 2013, depending upon your major source status and the engine information. NFPA 25, Inspection, Testing and Maintenance of Water Based Fire Protection Systems,1 was first published in 1992. After just over 20 years of availability, it is undergoing a review of sorts relative to its effectiveness. An article in NFPA Journal2 discussed recurring concerns about the enforcement and scope of the document. The article was tied to a special conference sponsored by the NFPA’s Fire Protection Research Foundation that took place on December 9-10, 2013 in Chicago. The aim is to improve enforceability of the standard, with the ultimate goal of improving sprinkler system performance even beyond the traditional high levels. New definitions of “adjust”, “clean”, rebuild” “remove”, repair”, “replace”, and “test” have been added to improve the application of the standard. New definitions of frequencies establish minimum and maximum times associated with quarterly, semiannual, annual, 3-year, and 5-year requirements. For example, “annual frequency” now means once per year with a minimum of 9 months and maximum of 15 months. The specific frequency of no-flow fire pump tests remains weekly for diesel-driven pumps, and monthly for electric pumps, but new exceptions will go back to weekly testing for non-redundant electric pumps if they serve high-rise buildings beyond the pumping capacity of the fire department, if they are equipped with limited service controllers, if they are vertical turbine pumps, or if they are used in conjunction with ground level tanks or other sources that do not provide sufficient pressure to be of material value without the pump. For all types of pumps, the option remains whereby the test frequency can be modified on the basis of an approved risk analysis. For diesel–driven pumps, NFPA 25 includes a new requirement to test the fuel annually for degradation. If found to be deficient, the fuel must be reconditioned or replaced. The standard includes a new Chapter 16 addressing the special inspection, testing and maintenance provisions of other NFPA codes and standards. For the time being, this includes only provisions excerpted from the NFPA 1013 dealing with NFPA 13D4 systems in small residential board and care facilities. The revised standard makes a distinction between a “valve status test” as opposed to the traditional “main drain test.” The main drain test is used to gauge the strength of the water supply available to the system and determine if any changes have taken place, while the valve status test is simply used to flow some water to verify that valves serving a portion of the system have been reopened following testing or repairs. The main drain test is required annually at each lead-in to the building (not each riser), while a valve status test is required at every return to service when valves have been operated. A clarification has been made that the 5-year testing of underground piping within Chapter 7 is intended to apply only when such piping serves hydrants. In Chapter 14, the terminology “assessment of the internal condition” replaces “internal inspection,” and while the 5-year inspection of the interior of the piping remains, the specific requirements for opening a flushing connection and removing a random sprinkler have disappeared. Language was added to require the replacement of missing or illegible hydraulic information signs. Pipe schedule systems are required to have signs indicating that they are pipe schedule systems. As important as the items changed are the requirements left unchanged, or rejected proposals. One of the areas in which the committee considered making changes, but ultimately did not, was in the area of time allowed for remedy of deficiencies. It was decided that this is an issue of enforcement best left to the discretion of the Authority Having Jurisdiction. NFPA 25, Inspection, Testing and Maintenance of Water Based Fire Protection Systems, National Fire Protection Association, Quincy, MA, 2014. Koffel, W., “Closer Look,” NFPA Journal, November/December, 2013, pp. 40-45. NFPA 101, Life Safety Code, National Fire Protection Association, Quincy, MA, 2013. NFPA 13D, Standard for the Installation of Sprinkler Systems in One- and Two-Family Dwellings and Manufactured Homes, National Fire Protection Association, Quincy, MA, 2013. Armstrong is very pleased to announce the release of Ace Online (AOL) – Engineering Version, an online selection tool that enables the design community to select Armstrong products from any location with an internet connection, and be able to access their database of projects from any computer. Ace Online will serve as a powerful tool to increase design efficiency and improve equipment selection practice. • Restriction free selections: Users are able to select Armstrong equipment and obtain desired information without having to enter project details, enabling them to obtain submittals, specifications and schedules in a timely manner. Having said this, the users are still able to enter the project information if they wish. • New interface structure: User interface has been enhanced to be more intuitive, simple, and aesthetically pleasing. • Sharing capabilities: The design engineer is able to share their projects with co-workers or their local representatives if they so choose. This allows the engineers to confirm selections, obtain equipment budget pricing easily, and review their projects with their representatives. • New reports: The reports section of the program has been greatly improved. The report creation screen has been simplified, the report output formats standardized, and a new schedule report function has been added. This new function will enable users to create schedules for equipment. • Dynamic Pump Curves: The duty point of your pump selection can by changed with drag & drop functionality. Ace Online provides both single-curve and multi-curve functionality. • Link to 3D Drawings: For each pump selection, you can choose to view or download the drawing with exact dimensions in a variety of formats, including industry-standard 2D and 3D formats. • Product Line: Pumps, circulators, heat exchangers, triple duty valves, suction guides, air / expansion control, controls, NFPA fire systems, and HVAC package systems. 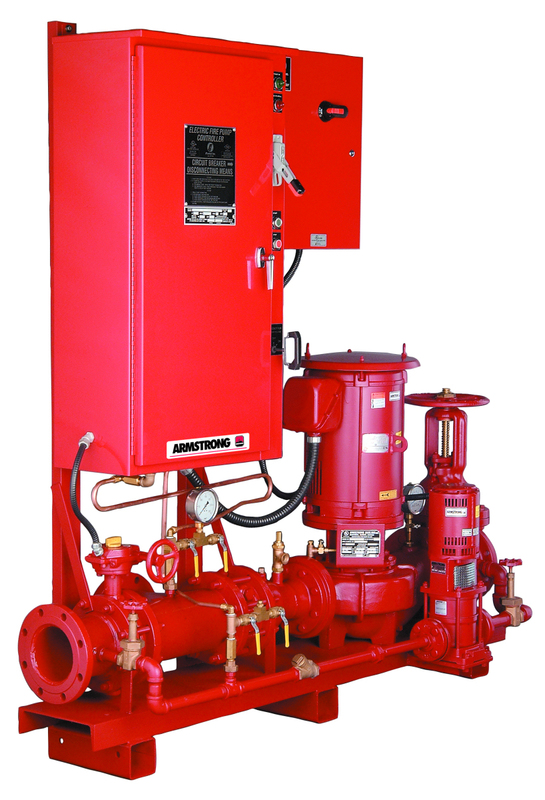 Armstrong Fire Pumps are UL listed and FM approved / Fastest lead times in the industry. Armstrong’s Quick Ship Program / Pump delivery in 2 weeks or less! Vertical Inlines and electric driven end suction fire pumps average 4 weeks from order to shipping. Horizontal split case electric motor fire pumps just 6 weeks. Diesel Fire Pumps 7 weeks. Armstrong’s ADEPT pump selection software program enables users to select a wide range of equipment as well as organize schedules, source submittals, and specifications. Screen designs allow users to view line drawings, multi-curves, photos, voltage, motor size, inlets, outlets, accessories, seal operating limits, seal options, construction options, and more than a dozen motor options. ADEPT complements Armstrong’s Design envelope products, including commercial and residential pumps, suction guides, and Flo-Trex valves. Anyone with experience in the sprinkler industry has come across at least one situation where a sprinkler system is installed or tested, then does not perform as expected. Looking into the root cause of the substandard performance, another water flow test is sometimes performed, and the numbers are vastly different. Usually when the system is not meeting design specifications, the water supply is worse. Final acceptance testing is a bad time to find out the water supply does not meet system demands, but it can be just as devastating prior to installation. The typical proposed solution is to conduct another flow test; does that truly indicate that the system can perform during the worst case scenario? Most fire protection engineers are faced with water supply challenges when designing sprinkler systems. Fire protection systems are required to perform under worst case scenarios including times of above-average domestic water demand. How does the system designer compare the test data obtained through a flow test to possible worst case conditions? How does the designer know if the test results even demonstrate the water supply during normal conditions? For these reasons, the idea of having an equation for adjustments to water flow data has become an increasingly hot topic. Although significant research has been performed on topics that affect water supplies, including forecast (predictive) modeling, water demands, and hydraulic modeling, insufficient research has been conducted with the focus on developing a single comprehensive adjustment equation for use in designing sprinkler systems. NFPA standards have typically identified the need to account for variations in water supplies but have not provided guidance for adjustments to water supplies or provided safety factors. Fire protection engineers and sprinkler contractors have historically looked to local amendments or policies to the fire codes for adjustment factors to account for variations in water supply conditions in many jurisdictions. Sometimes the adjustments are known before starting a design. Sometimes they are found during the review of drawings or during testing of the systems. The problem is that the methodologies for making these adjustments vary widely and there may be little consistency from one jurisdiction to the next. Additionally, the justification for these adjustments may not even be based on fluctuations in water supplies, but account for variations between the calculated design drawings and the actual field installation. To understand why water supplies have fluctuations, we need to understand the different industry practices when designing water distribution systems. Sprinkler systems that are not supplied by a dedicated gravity tank, or tank and pump must rely on the water authority for the pressure and flow to supply the sprinkler system. A fire pump can be used to boost the pressure from the water distribution system, but it cannot create more water if the water supply system cannot provide the necessary amount. For this reason, it is important to understand the design difference between sprinkler systems designed to National Fire Protection Association (NFPA) standards and water distribution systems in accordance with American Water Works Association (AWWA). When designing sprinkler systems, the designer has NFPA codes and standards regulating the minimum performance of the system. Design discharge densities over sprinkler coverage areas are clearly identified through requirements in the reference standards. Hydraulic calculations are preformed from the hydraulically most remote area to the connection to the water supply. Minimum water supply demand requirements for the system are identified. Minimum water demand requirements for the system do not vary over time unless the hazard being protected changes or the system is modified. In such cases, a new analysis of the system needs to be performed. When water authorities are designing water distribution systems, they do not have AWWA codes or standards regulating minimum system pressures at specific flows. Local regulations may require certain minimum system performance, but these regulations are specific only for their jurisdictions and are not universally adopted. Neighboring jurisdictions that have different water authorities may have vastly different regulations. Additionally, the consumers of water and the usage of water vary between different communities. This variation in the usage of water creates variable demands that are difficult to quantify. Because the demands are variable, water authorities typically have operational ranges within which the systems are maintained. Through the use of elevated storage tanks, operation of additional pumps, pressure regulating valves, and other system components, the water authorities try to maintain their system pressures while the demand varies. The methods these water authorities use to maintain pressure also varies. One jurisdiction may have manual pumps while the neighboring jurisdiction uses variable speed drive pumps or a gravity supply system. If the manual used to design the water distribution system indicates that the water supply fluctuates, why are sprinkler designers only using one set of data to design the system? An example of this variation in water supplies is discussed next from an evaluation of a campus water supply. Variations in water supplies can sometimes reveal bigger issues. The authors completed the evaluation of a campus water supply to address what the client thought was an aging water distribution system at its facility. In this case, water was supplied to the campus through two separate connections to a privately operated water distribution system. Each water supply connection was equipped with a water meter and backflow preventer. The evaluation was prompted as the result of an identified water supply inadequacy found for a single building where two tests had been conducted with differing results. The first test, conducted by a design engineer, demonstrated that the water supply was sufficient to meet sprinkler system demand. The second test was conducted by the sprinkler contractor more than a year later as part of the sprinkler system design. This test identified an inadequacy in the water supply and raised questions because the water supply at this location had been considered sufficient for designing sprinkler systems prior to that test. The objective of the evaluation was to identify areas of improvement at the campus. Hydrant flow testing was performed to facilitate evaluation of the adequacy of the existing underground fire main piping to supply the required flow and pressures for manual and automatic fire fighting needs and to develop an effective friction coefficient for the underground pipe network. Testing the system demonstrated worse performance than originally anticipated. Comparison of the water supply results to fire protection system demands throughout the campus indicated that the water supply was inadequate for a number of the buildings. Static pressure readings measured throughout the facility were lower than values historically recorded. Additionally, residual pressure readings under fixed flow conditions (measured along isolated distribution system paths) yielded abnormal results. The data was used to compare measured results to similar conditions with known Hazen-Williams coefficient of roughness values. However, the results of the evaluations did not allow for isolated repairs or replacements on campus as hoped. As a result, a second series of tests was conducted when the water supply was believed to have the lowest usage and its best performance. That was not the case; the results of this testing revealed worse performance than previously observed. The water authority was contacted. It was determined that the water distribution system was controlled through observation of water pressure by an operator at the supply pumping station with a normal variation of approximately 5 psi. Supply pressures of 45 to 50 psi were normally maintained at the pumping station. However, the differences in the measured static pressures at the campus during the two tests were determined to be approximately 7 psi. It was determined that the water authority reduced the system operating pressure over a number years and system demands increased in the surrounding communities due to the construction of several new facilities. As a result, the available water supply (pressure and flow) at the entrance to the campus deteriorated over time. WHAT IS BEING DONE TO HELP SYSTEM DESIGNERS? NFPA technical committees are trying to quantify daily, seasonal, geographical, and other fluctuations to water supplies that are encountered during water flow tests to determine the typical pressure and flow during peak demands when tests are performed during non-peak times. Limited attempts have been made to provide an adjustment factor(s), which have been proposed to several NFPA technical committees, but could not be accepted due to insufficient technical support for these adjustments. A Fire Protection Research Foundation (FPRF) literature review, titled “Quantification of Water Flow Data Adjustments for Sprinkler System Design,” found several things. First, daily, seasonal, geographical, and other fluctuations are real and can impact the data collected during water flow tests; secondly, there is relatively little data on how these fluctuations affect pressure. The majority of research on water supplies has been conducted for determining the quantity of water end users consume during certain periods of time. In most cases, this research is focused on domestic users because they are easily categorized by type of residence and number of individuals. Commercial and industrial users are harder to categorize due to the many uses of water other than domestic. It was determined that there was insufficient data to provide recommendations at this time regarding water supply adjustments. The reasons: 1) a lack of data associating flow rates and available pressure, 2) insufficient data to provide meaningful comparisons between regions and within specific regions, 3) a lack of data for all identified variables, and 4) data was not limited to a single variable or discrete number of variables that would allow for development of adjustment factors. Without an adopted adjustment factor, the system designer and plans reviewer should contact water authorities when performing flow tests to determine the best time to conduct the test during normal or high demands. For tests that have already been conducted, designers can ask how the flow conditions observed during the test compare to normal or high system flow conditions. This would meet the current recommendations of NFPA 291 for conducting tests during a period of ordinary demand. When water authorities provide modeled hydrant flow for use in sprinkler system designs, they should be asked how well the hydraulic models are calibrated (how the modeled hydrant flow tests compare to actual hydrant flow tests) and reduce the modeled hydrant flow test by the percentage difference they observed in their calibration (e.g., 10%, 20%, 25%, etc.). When designers are unable to contact the water authority, they should perform several flow tests at different times of the day to determine when the period of normal or high demand occurs, or the designers can design the sprinkler system with a margin of safety with the intent to account for variation in the water supply. Design practices such as reducing pipe sizes that increase demand pressures should be minimized in areas where the variation in the water supply is not known. Ultimately, it is the designer’s responsibility to understand the characteristics of the water supply they are using to supply their fire protection system. Recent research has identified major factors that contribute to these variations; however, insufficient data is currently available to quantify these factors for the development of an overall adjustment factor. Joseph E. Kurry and Mark Hopkins are with JENSEN HUGHES. A fire pump is a part of a fire sprinkler system’s water supply and Powered by electric, diesel or steam. The pump intake is either connected to the public underground water supply piping, or a static water source (e.g., tank, reservoir, lake). The pump provides water flow at a higher pressure to the sprinkler system risers and hose standpipes. A fire pump is tested and listed for its use specifically for fire service by a third-party testing and listing agency, such as UL or FM Global. The main code that governs fire pump installations in North America is the National Fire Protection Association‘s NFPA 20 Standard for the Installation of Stationary Fire Pumps for Fire Protection. A jockey pump is sized for a flow less than the flow to one sprinkler in order to ensure a system pressure drop. Hence a jockey pump is an important part of the fire pumps control system. Jockey pumps are typically small multistage centrifugal pumps, and do not have to be listed or certified for fire system application. The control equipment for jockey pumps may however carry approvals. Jockey pumps should be sized for 1% of the flow of the main fire pump and to provide 10psi more pressure than the main fire pump. The application of a jockey pump in a fire protection system is provided by NFPA 20. Both systems are to be maintained and inspected per NFPA 25 “Inspection and Testing of Water-Based Fire Protection Systems”.